As specialists in geomechanics and geotechnical engineering, our research group looks at how soils and rocks deform under loading. We have broad interests ranging from fundamental research (e.g., mechanics of geomaterials) to applications (e.g., foundation design and in situ testing). Our interests include computational plasticity, geotechnical analysis, contact mechanics, soil-machine interaction, and the analysis of problems involving unsteady plastic flow. A major focal point of our work over the coming years is to advance the understanding of how soils are moved and shaped through interaction with man-made objects and machinery. The overarching goal of these activities is to develop rigorous, mechanics-based models for predicting soil deformation and the corresponding force requirements or reactions. Hambleton, J.P., Stanier, S.A., White, D.J. and Sloan, S.W. (2014). Modelling ploughing and cutting processes in soils. Australian Geomechanics, 49(4), 147-156. Kashizadeh, E., Hambleton, J.P. and Stanier, S.A. (2014). A numerical approach for modelling the ploughing process in sands. Proc. 14th International Conference of the International Association for Computer Methods and Advances in Geomechanics, Kyoto, Japan, Sept. 22-25, pp. 159-164. Human beings move a remarkable quantity of earth for civil construction (Fig. 1a). Entering into the new millennium, Hooke (1994, 2000) estimated that humans move between 30 and 35 trillion kilograms annually worldwide for housing excavations, road building, and mineral production. This corresponds to 6,000 kilograms annually per capita, a figure that excludes the astronomical quantities we shift for agriculture, as well as sharp increases from a surging growth in demand, particularly for rare earth elements (Alonso et al., 2012). Expressed in another way, a human effectively moves on the order of 100 times his or her body mass per year. If one focuses only the US, this number jumps by a factor of 5. Still, this is nothing compared to the productivity of other Earth inhabitants (Fig. 1b), including insects, worms, and rodents. An ant can move as much as 200 to 300 times its body mass per day (Espinoza & Santamarina, 2010). Earthmoving is a field where scientific understanding lags well behind the technology, and technology apparently lags well behind the apparatus of nature. Clearly, when it comes to moving soils, humans have much to learn from ants, moles, and other creatures. From a scientific viewpoint, the theories that will underpin these advances remain to be developed. The most prevalent theoretical models rest on methods dating back to the eighteenth century. Synthesis of review papers and monographs (e.g., Godwin and O’Dogherty, 2007; McKyes, 1985; Balovnev, 1983) reveals a strong dependence on empirical relationships and crude models subsumed from theories developed for retaining walls and foundations, although somewhat more mature theories can be found in the literature pertaining to metalworking and tribology (Atkins, 2009). Historically, problems involving soil-machine interaction have been considered by those who design the machines rather than those who study the mechanical response of soils. Recognizing that earthmoving lies at the interface between geotechnical and mechanical engineering is a first step in cracking the problem wide open. Whether the application is civil construction, tribology, or even planetary exploration (Fig. 1c; Wilkinson and DeGennaro, 2007), the means by which soil is mechanically moved and shaped often comes down to two fundamental processes: plowing and cutting. Both terms refer to the progressive displacement of relatively large volumes by a tool or object, and the difference lies in whether material is subsequently removed. From an engineering perspective, understanding the full history of forces and material deformation is essential. In earthmoving, one may wish to minimize tool forces for optimal machine performance and efficiency. On the other hand, tractive devices such as grousers (Sutoh et al., 2013) and laterally loaded grillage foundations (Knappett et al., 2012), both of which tend to push significant volumes of soil as they displace across a soil surface, are designed to maximize resistance. The history of material deformation is ultimately linked to aspects such as productivity and the degree of material disturbance, the latter determining properties of the stratum and any volume of material removed. To formulate a new class of theoretical models based on the kinematic approach of plasticity theory. The models will be based on a new paradigm for modeling processes involving large deformation, and will be the first to predict the complete history of forces and deformations rigorously and efficiently. To inform and validate the theoretical models developed in Aim 1 by conducting experiments, using our new Soil-Structure and Soil-Machine Interaction Laboratory at Northwestern University, which is dedicated broadly to studying problems in soil-machine interactions with the aid of modern robotics. Figure 2. Sequential approach for 2D numerical modeling of cutting in dry sand by a vertical plate (Hambleton et al. 2014, Kashizadeh et al. 2014): (a) assumed mode of deformation; (b) discretization, optimization, and updating; and (c) definition of softening. Figure 3. Preliminary experiments on cutting of sand by a vertical blade by the PI and co-workers (Hambleton et al. 2014): contours of incremental shear strain inferred using PIV, revealing the locations of zones of concentrated shearing (slip surface or shear band) at instants (a) before and (b) after the shear band has transitioned to a new location within material; (c) corresponding normalized force-displacement history. Hambleton, J.P. and Drescher, A. (2009). On modeling a rolling wheel in the presence of plastic deformation as a three- or two-dimensional process. International Journal of Mechanical Sciences, 51(11-12), 846-855. Hambleton, J.P. and Drescher, A. (2009). Modeling wheel-induced rutting in soils: Rolling. Journal of Terramechanics, 46(2), 35-47. Hambleton, J.P. and Drescher, A. (2008). Modeling wheel-induced rutting in soils: Indentation. Journal of Terramechanics, 45(6), 201-211. Shi, Z. and Hambleton, J.P. (2018). An r -h adaptive kinematic approach for 3D limit analysis. Computers and Geotechnics, (under review). engrXiv:10.17605/OSF.IO/M7HSU. Hambleton, J.P. and Sloan, S.W. (2016). A simplified kinematic method for 3D limit analysis. Applied Mechanics and Materials, 846, 342-347. Hambleton, J.P. and Sloan, S.W. (2013). A perturbation method for optimization of rigid block mechanisms in the kinematic method of limit analysis. Computers and Geotechnics, 48, 260-271. Abbo, A.J., Lyamin, A.V., Sloan, S.W. and Hambleton, J.P. (2011). A C2 continuous approximation to the Mohr–Coulomb yield surface. International Journal of Solids and Structures, 48(21), 3001-3010. Hambleton, J.P., Sloan, S.W., Pyatigorets, A.V. and Voller, V.R. (2011). Lower bound limit analysis using the Control Volume Finite Element Method. Proc. 13th International Conference of the International Association for Computer Methods and Advances in Geomechanics, Melbourne, Australia, May 9-11, Vol. 1, pp. 88-93. Hambleton, J.P., Stanier, S.A., Gaudin, C. and Todeshkejoei, K. (2014). Analysis of installation forces for helical piles in clay. Australian Geomechanics, 49(4), 73-79. Todeshkejoei, C., Hambleton, J.P., Stanier, S.A. and Gaudin, C. (2014). Modelling installation of helical anchors in clay. Proc. 14th International Conference of the International Association for Computer Methods and Advances in Geomechanics, Kyoto, Japan, Sept. 22-25, pp. 917-922. Screw piles are deep foundations consisting of one or more helical plates mounted to a central shaft installed by twisting the pile into the ground under an applied torque and axial (crowd) force. On account of the relative ease of the installation process compared to traditional deep foundations and growing acceptance within the geotechnical engineering community, the popularity of screw piles has risen markedly over the past few decades. Figure 4 depicts several applications where helical piles are routinely used. Apart from these well-established applications, screw piles have been identified as a promising foundation solution for near-shore wave energy converters. Common alternatives to the term “screw pile” include “helical piles” and “helical anchors,” the latter being reserved for applications involving uplift (e.g., Figures 4b,c,d). Despite the recognized impacts of the installation process on the performance of screw piles, and in particular the widely adopted use of installation torque as an indicator of ultimate capacity, relatively few attempts have been made to model the installation process theoretically. Figure 4. Conventional applications for screw piles: (a) foundation underpinning, (b) guy wire anchors, (c) tiebacks for retaining walls, and (d) buoyancy control for pipelines (Hambleton et al., 2014). Our research on screw piles is aimed at understanding the mechanics of the installation process in soils, starting with the installation of multi-helix screw piles in clay (Hambleton et al., 2014; Todeshkejoei et al., 2014). The essential parameters are depicted in Figure 5a, and the basis for a generalized static and kinematic framework is set out in Figure 5b (for details, see Hambleton et al., 2014 ). In conjunction with finite element simulations used to infer the behavior of a single screw plate (Figure 6), this framework predicts the relationship between the total installation torque T for a given value of axial force N, as well as the normalized installation rate ∆u/(D∆ω) (see Figure 6b). The results can be synthesized into convenient yield envelopes showing how T varies as a function of N for different pile configurations. Typical results are plotted in Figure 6b. These highlight that the shape of yield envelope is heavily dependent on the ratio of the pitch to the helix diameter, p/D. 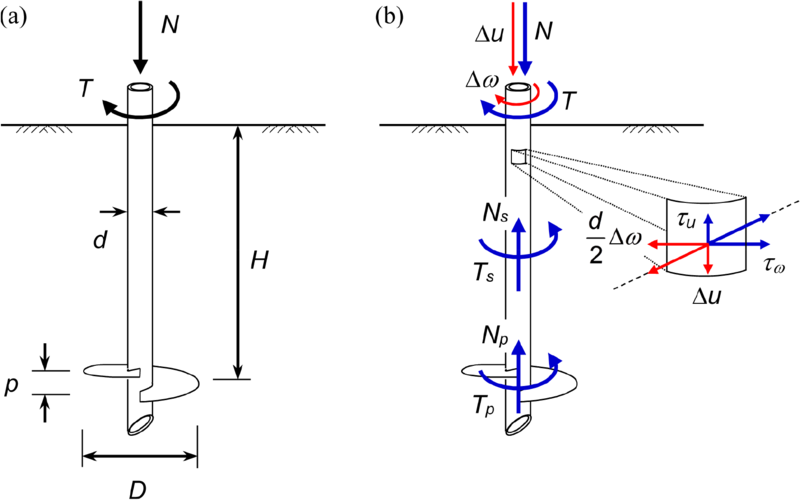 For small ratios, the installation torque T remains roughly constant over a range of the axial force N but drops sharply as N approaches a certain value. The effect of the axial force becomes more significant as p/D grows. For large pitch ratios, the relationship between T and N becomes roughly linear. The shape of the yield envelope has a direct influence on the kinematics, as one would expect given that associativity, or normality, on the element level also implies normality of generalized forces. Depending on the load combination, the pile can “under-rotate,” “neutrally rotate,” or “over-rotate” (Hambleton et al., 2014), which in turn affects the amount of soil disturbance. A series of experiments using the centrifuge testing facilities available at The University of Western Australia has been completed to validate the theoretical models. The full body of work, which includes the analysis of multi-helix systems, will be presented in the forthcoming PhD thesis by Cyrus Todeshkejoei. Figure 5. Schematic of a deeply embedded helical pile with a single helical plate: (a) installation forces and key dimensions; (b) forces on the shaft and helical plate and shear stresses generated along the shaft (Hambleton et al., 2014). Figure 6. (a) Example configuration from a finite element simulation of a single helical plate embedded within soil and (b) corresponding values of installation torque T, normalized by undrained shear strength su and plate diameter D, for different values of normalized axial force N (Todeshkejoei et al., 2014). Project Summary: This investigation will advance the understanding of how soils are mechanically moved and shaped through interaction with earthmoving tools and machinery. Humans move enormous quantities of soil for civil construction, mining, and agriculture, but our knowledge of the physical processes by which machines interact with soils is surprising limited. This project will generate a new class of computational models for simulating fundamental earthmoving processes. In parallel, an experimental program completed at small scale in the laboratory will provide physical insights and the high-quality data necessary to assess the models. This exploratory research will form the basis for future long-term studies on the optimization and automation of earthmoving machinery, enabling new, potentially radical, machine designs and techniques. Considering the scale at which humans move earth in US and the rest of the world, even the smallest breakthroughs leading to greater efficiency and increased productivity will have profound long-term effects with respect to reducing costs, improving production times, and reducing energy consumption. This project will specifically develop and validate mechanics-based models for plowing and cutting processes in soils. As exploratory research intended to expand into broader studies examining a wide variety of machine configurations and soils types, focus is on dry granular materials, elementary tool shapes, and relatively simple tool motions. Specific research objectives are (1) to formulate a new class of theoretical models based on the kinematic approach of plasticity theory and (2) to inform and validate these models by conducting a series of preliminary experiments in a new facility at Northwestern University utilizing a fluidized bed for sample preparation and a fully instrumented 6-axis robotic armature for actuation and force measurement. The theoretical models are premised on a new paradigm for modeling processes involving large deformation, and will be the first to predict the complete history of forces and deformations rigorously and efficiently, potentially achieving the high levels of efficiency necessary for machine optimization and automation. This research will quantify, precisely and definitively, complete force and deformation histories for characteristic geometries and materials, laying the groundwork for a long-term research program aimed at exploring innovative designs and techniques for earthmoving in civil construction, mining, and agriculture. Project Summary: This project directly addresses major challenges facing the emerging field of soft robotics. Soft robots are made of inherently compliant materials that are soft, flexible, and move gracefully in three dimensions without requiring discrete joints. However, these highly compliant soft bodies may prove too weak to exert sufficiently large forces to accomplish desired tasks. Additionally, there is a general lack of understanding of how to best navigate the bewildering spectrum of materials, configurations, and designs available to soft robotics. This project explores the properties of 3D-printable polyurethane polymers that can be customized to provide different mechanical properties. This project will create mathematical models of highly deformable structures, and computational tools to solve the “inverse problem” of finding the material parameters and 3D printing pattern that achieve a specified structural behavior. The project will consider two currently infeasible tasks at greatly different length scales. Task 1 is a millimeter-scale patient-specific soft robot catheter for neurovascular and cardiovascular applications, where the robots can gently move through blood vessels without requiring risky surgery, blocking blood flow, or injuring the patient. Task 2 is a meter-scale robot that intelligently burrows underground, with force levels much higher than previously attained by soft robots. Soft robots in the vascular application can inform potential breakthroughs for the treatment of heart disease and stroke. Large burrowing robots could prove beneficial for inspecting underground civil infrastructure or laying new fiber optic cable, irrigation, or power lines. This project is also designed to engage high school students, and inspire them to pursue STEM careers, including future roboticists. This project will establish and validate a mathematical framework for the inverse design of universal soft robots that: 1) provide sophisticated 3-D kinematics by further generalizing fiber-reinforced elastomeric enclosures with beam elements and arbitrary shapes along with exceptional force and power densities that match well-known McKibben actuators; 2) achieve arbitrarily-specified tasks and performance requirements including novel multiscale burrowing behavior; and 3) dictate a new means of robotic, automated manufacturing via 3D printed materials exploiting highly anisotropic elastomers, inextensible fibers, and beam elements and their interfacial chemistries. This mathematical formalism generalizes traditional robot kinematics via a full body mapping incorporating dynamic, arbitrary shape sequences specified by an arbitrary desired task. The coupled innovation in polyurethane chemistry and manufacturing will enable soft robots that exceed the capabilities of existing soft robots and overcome fundamental limitations in their capacity to exert useful force, modulate stiffness, and achieve previously-impossible tasks. This project includes validation experiments on two specific testbeds: (1) millimeter-scale soft robot catheters that locomote through vascular networks, and (2) meter-scale burrowing robots in soils, capable of inferring soil properties to adapt their morphology and motion to suit conditions in naturally occurring, highly heterogeneous, soil deposits. Project Summary: This project aims to establish a geotechnical design framework for shared anchoring systems subjected to multidirectional cyclic loading for large integrated arrays of floating wind turbines and floating wave energy converters. This is expected to facilitate new, economic foundation solutions, generating radical cost savings to help unlock Australia’s renewable ocean energy resources. The project aims to utilise a blend of state-of-the-art centrifuge modelling techniques and numerical modelling, incorporating an energy-based method and yield envelopes. This innovative methodology aims to establish a validated framework for understanding and predicting foundation performance under the complex load histories arising in renewable ocean energy applications. Project Summary: The objective of this project is to develop rigorous, mechanics-based models for ploughing and cutting processes in soils, which lie at the heart of earthmoving operations occurring on an enormous scale within Australia and worldwide. This project intends to integrate state-of-the-art physical modelling with the development of innovative techniques for numerical modelling to elucidate and predict the full unsteady progression of forces and deformations in both two-dimensional and three-dimensional processes. This project aims to help to increase the productivity, efficiency, and overall cost-effectiveness of earthmoving operations by advancing the scientific understanding of how soils are moved and shaped. Project Summary: Synthetic energy absorbing composite for improved track performance. This project aims to study the performance of a novel synthetic energy absorbing composite (SEAC) placed beneath the railway ballast to minimise degradation. The use of coal wash and steel slag blended with shredded recycled rubber as SEAC constituents is environmentally beneficial. The role of SEAC with respect to impact and cyclic loads will be assessed through extensive geotechnical laboratory and numerical analysis. The research outcomes based on the proposed energy considerations will lead to improved track design and analysis in view of stability, safety and operational efficiency.